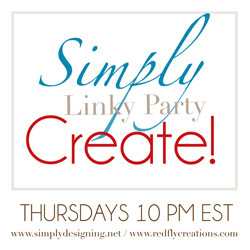 Welcome to my joint Simply Create Link Party with Ashley over at Simply Designing. Last week was so much fun! I enjoyed looking at all the wonderful projects, recipes, tips, and more. If you missed our wonderful features last Tuesday, you really should check out our favorites HERE. Thank you Rachel! We did have fun. :) You'll have to let me know if you try the tarts and what you thought of them. Have a great week! Than you Melissa for hosting a great party! Hi Melissa! Thank you so much for Hosting! As always a lovely Party! Thanks for hosting the party, Melissa! Thank you to all you Ladies!! I love having you stop by. You are all great inspiration!